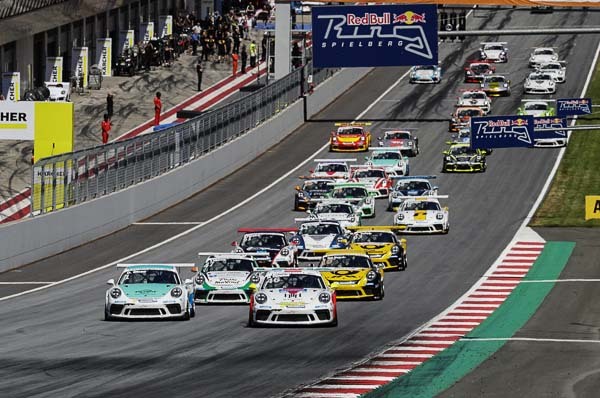 At the Red Bull Ring in Spielberg, Austria, Porsche Junior Dennis Olsen (Konrad Motorsport) celebrated his fourth win of this year’s Porsche Carrera Cup Deutschland. The Norwegian won round six on Sunday at the wheel of his 485 hp Porsche 911 GT3 Cup in front of Nick Yelloly (Team Deutsche Post by Project 1) from Great Britain and Porsche Junior Matt Campbell (AUS/Fach Auto Tech). “Fantastic! I was a touch faster than Matt Campbell at the start and that proved decisive for the win,” said Olsen. Taking up the race as pole-sitter, Campbell was not able to his defend his lead spot from Olsen, who made a catapult start and beat the 22-year-old Australian in the sprint to the first corner. Olsen proceeded to build a half-second gap, only to have his advantage erased by a safety car which was deployed after a collision between two midfielders. Olsen made the most of the restart to again pull clear of Campbell. The junior driver from the Norwegian town of Våler kept a cool head after another safety car phase to ultimately bring home victory after 19 laps. After the start, Yelloly worked his way through the field from fifth on the grid to third place. The Deutsche Post by Project 1 pilot caught up to Campbell and in the penultimate lap swept past him on the inside of the hairpin. “Second place is the result of outstanding team work. The duel with Matt Campbell was intensive but fair,” explained Yelloly. Behind Yelloly, Campbell concluded the race on the 4.326-kilometre circuit in third place. “A win on Saturday and third place today – that’s great. In the mid-sector of the second race I wasn’t able to match the pace of the frontrunners but all in all it was an excellent weekend,” declared the Porsche Junior. For Campbell, round six of the national one-make race series was an ideal way to prepare for the Porsche Mobil 1 Supercup, which will run as support to the Formula 1 race in Spielberg in early July. As the best rookie of the day, Larry Ten Voorde (NL/Team Deutsche Post by Project 1) clinched fourth place. The Luxembourg guest driver Dylan Pereira from Zele Racing finished on fifth place ahead of Christopher Zöchling (A/MRS GT-Racing).